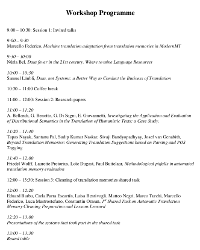 The programme and the abstracts of the presentations of the 2nd Workshop on Natural Language Processing for Translation Memories to be held in conjunction with LREC 2016 is available on the workshops website. It features three invited speakers, four research papers, a shared task and a round table. We hope to see you in Portorož. This entry was posted in news and tagged translation memories, workshop on April 13, 2016 by c.orasan. The details of the shared task on cleaning of translation memories organised at the 2nd Workshop on Natural Language Processing for Translation Memories have been published. We hope it will be a successful task given the amount of traffic the page has received in the first 24h since it was announced. This entry was posted in news and tagged shared task, translation memories on February 9, 2016 by c.orasan. The second call for papers for the 2nd Workshop on Natural Language Processing for Translation Memories (NLP4TM 2016) to be organised in conjunction with LREC 2016 has been distributed. The deadline for paper submission is in 2 week. For more details please visit the workshop’s web page. This entry was posted in news and tagged EXPERT project, translation memories, workshop on January 28, 2016 by c.orasan. This entry was posted in news and tagged special issue, translation memories on January 14, 2016 by c.orasan. Approach: Rohit Gupta and Constantin Orasan. 2014. Incorporating Paraphrasing in Translation Memory Matching and Retrieval. In Proceedings of the European Association of Machine Translation (EAMT-2014). Human Evaluations: Rohit Gupta, Constantin Orasan, Marcos Zampieri, Mihaela Vela and Josef van Genabith. 2015. Can Transfer Memories afford not to use paraphrasing? In Proceeding of EAMT-2015, Antalya Turkey. The tool was developed part of the EXPERT project. This entry was posted in news and tagged EXPERT project, software, translation memories on October 16, 2015 by c.orasan. The 2nd Call for Papers of the Workshop on Natural Language Processing for Translation Memories (NLP4TM) organised at RANLP 2015 by Constantin Orasan and Rohit Gupta has been published. Information about the topics addressed by the workshop and important dates can be found on the workshop’s webpage. This entry was posted in news and tagged CFP, translation memories on June 16, 2015 by c.orasan. The Research Group in Computational Linguistics (RGCL) at the University of Wolverhampton was founded by Prof. Ruslan Mitkov in 1998 and is one of the leading research institutes in the UK. The group is well known for its high level research with strong international and inter-sector collaboration, and is renowned for its innovative NLP research and development of various NLP tools and resources. What happens on the course? Who will teach you on this course? What skills will you gain?